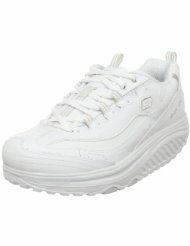 I love the Sketcher Shape-Up! As the fifth shoe on my list, I am going to be brutally frank and tell you why I like this shoe – when I have patients who desperately need the MBT but can’t afford it’s $250 price tag – I send them to purchase the Sketcher Shape-Up which I describe as the “less expensive version of the MBT.” I know that is not the most flattering picture I can paint of this shoe but I will say that I am extremely grateful that it exists! The Sketcher Shape-Up is a great walking shoe for a wide variety of foot ailments as well as knee, hip and lower back pain. In particular, it works well for patients with heel pain, metatarsalgia, osteoarthritis, and forefoot issues such as capsulitis, bunions, and painful calluses. It is also great for anyone who works on their feet all day on concrete floors. It has great shock absorption and is super-protective of the foot so that is will help prevent injuries, prevent wear-and-tear of the joints and prevent progression of many foot pathologies that you might already have developed (i.e. bunions and hammertoes). I recommend that you wear a custom-molded orthotic or an excellent over-the-counter insert for arch support with this shoe. The New Balance 845 is also an excellent walking shoe – the thing that sets it apart is that it has a Roll-Bar Technology which offers optimal protection for the foot during gait. It has a wide toebox and excellent rearfoot control which make it an ideal shoe for patients who suffer with a variety of foot complaints including bunions, hammertoes, heel pain, osteoarthritis, metatarsalgia – just to mention a few. I’ve found this shoe online for as little as $35 at 6pm.com. I call this shoe “Old Faithful” because it never fails. With the exception of patients with severe foot deformities, this is a great walking shoe that offers a rigid, protective sole, a wide soft toe-box and excellent rearfoot control. It has Rollbar Technology which offers motion control for maximum stability. It also has cushioning in the heel for increased shock absorption and overall, it is a relatively light shoe. This is a great shoe for diabetic patients as it is considered an “extra-depth shoe” that offers extra room in the toe area to help prevent the development of corns, calluses, blisters and ulcers. If you are diabetic or have neuropathy (nerve damage), I would recommend adding an accommodative insert made of plastizote as an insole. Plastizote has been proven to decrease friction that can lead to blisters, calluses and ulcers. You can usually purchase an over-the-counter version of this insert from a Podiatrist or online and if you are a Medicare patient, the cost of the shoe and the inserts should be covered by Medicare if you get them through a Podiatrist’s office that participates in the extra-depth shoe program. I own this shoe also and whenever my lower back hurts, I immediately put these on and, for me, it’s instant relief. I also recommend this shoe for anyone who works long hours on hard floor surfaces. Many of my patients who are postal employees, teachers or are in retail have benefited from this shoe. I recommend wearing a custom-molded orthotic or at least an excellent over-the-counter insert for proper arch support to maximize it’s benefits. I also recommend this shoe for patients with heel pain, forefoot pain such as metatarsalgia, osteoarthritis, hallux limitus/rigidus (limited motion at the 1st toe joint) and knee, hip and lower back pain. There are some limitations to this shoe and that is the only reason I have rated it as a runner up to first place. This shoe is not appropriate for patients with Achilles Tendonitis, balance issues or nerve damage. 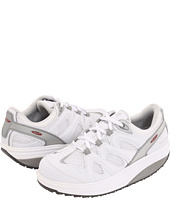 It is a very strong and heavy shoe and is not for everyone – especially not for the elderly. I recommend that if you are trying this shoe for the first time that you do not purchase it online – find a store where you can try out the shoe. If you do purchase the shoe, do a slow break-in period of wearing it one hour the first day, two hours the second day, three hours the third day, ect – until you are able to wear it for a full day. If you get into this shoe too quickly and too aggressively, you may experience some knee, hip and lower back discomfort. Please see my blog article featuring the MBT for more information. The Spira Classic is my personal favorite! It has a rigid sole with hidden “Wave Spring Technology” that stores and disperses energy at every step. The sole is thick and protective while having hidden springs that give excellent shock absorption and returns energy during gait. It can be optimized by adding a custom-molded insert and is appropriate shoe-gear for a wide variety of patients and foot pathologies. I also like that is is relatively light while remaining strong and supportive. Plus, I like the way it looks – it’s form meets function. Please see my blog report on this shoe for more information and a full review.